In an informal conversation held at the Berkshire Museum in Pittsfield, MA on August 6, 2011, Edward J. Sullivan, professor of art history at NYU, writer, and curator, sat down with Roberto Juarez to talk about his most recent exhibition Mural Paintings. 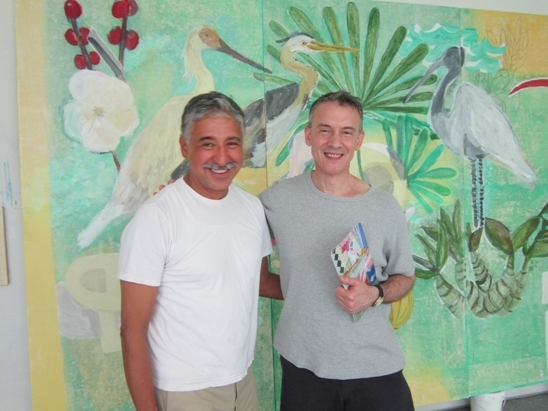 Together they discuss the difference between public and private art, and Juarez explains the role of abstraction in nature through his painting process. Edward J. Sullivan: Well, the whole idea of this conversation is for us to have a dialogue, mainly about ideas, and it’s such a treat to be with the artist at this extraordinary exhibition. Roberto is somebody I had long thought combined a sense of an engagement with the poetic, an engagement with the provocative, a use of color which brings to mind not only images but emotions in a way that is very convincing but also allows us to enter into a certain subconscious emotional territory about which I am going to ask him, along with questions I’ve been thinking about relating to art in the public sphere. I think if we begin to think about this, we have to use our historical acumen and think about various definitions about what public art is from the Western classical tradition to manifestations of mural art in the Renaissance, all the way into the 20th century in places like Mexico and the United States, where artists like Rivera, Orozco, and Siqueiros were working as part of a mural tradition that spurred American artists during the Depression to create their own series of public works. And I think to a certain extent the importance of reception, the importance of a space in which there are images that communicate ideas . . . it is to this tradition that Roberto belongs, particularly in the work that we see in this museum. So we should probably start this conversation by my asking you: How would you define these works as public art, and maybe you could talk a little bit about the origin of them, how these commissions came to be and what you think about them in terms of their “public-ness”? Roberto Juarez: For “Times square Tiles” and “New Building” I didn’t want to make a window or a picture that sat on a wall, and so the limitations of the size of the wall of my loft became my project, which was a private commission for Whitman College in Walla Walla, WA. They are fairly abstract paintings, and I composed them using pieces of rice paper tiled onto the surface which became the language that allowed me to expand the vision of what a picture was to fit the dimensions of what I needed it to be. So after I did these for myself, so to speak, and then exhibited them in New York, Bonnie Clearwater showed these pictures at the Museum of Contemporary Art in Miami, and from there the G.S.A. asked if I would propose something for a courthouse. That’s how I got this commission in Washington. I had also done other public commissions for Grand Central Terminal, which helped me be able to compose something as large as this. EJS: Do you consider these paintings “murals” in the traditional sense or do they come out of the experiments with both figuration and abstraction that you’ve been doing now for decades from a more private sense? How do you conceive of these things as images to be consumed by a large public? RJ: I think when you paint paintings for a public situation, such as a courthouse building in this instance, you absolutely have to think about who the audience will be and how they will live in a building. These particular paintings were painted for either end of a very large lobby which is very cold, very institutionalized, and I thought that it could use some life by bringing in color and plants. There are flowers, there is a movement that could be about growth, or the relationship of vegetation in nature, but it is a very abstract thing that makes me excited. In “Cultural Law” I wanted to use something that described the abstract nature of the legal system, which is the situation that these paintings will live in. When you leave the building, you see this green, more natural painting, “Natural Justice” as a beckoning back into nature, back into life, as something bigger than the situation that you were just in. Hopefully, bringing you back into the real world. EJS: I had an experience the other night at the courthouse. I was to go to a meeting of the town of Taghkanic in Columbia County. The meeting was to take place in one building and I went into the courthouse next door by mistake where they were having traffic court and it was a pretty scary situation. People are very nervous, they’re waiting for the judge to come, they’re sitting in a very stark room and I began to think of Roberto’s paintings because the painting that we see to our right will be destined for a children’s courthouse in Miami. So, it is the contrast of my brief experience in the town of Taghkanic courthouse the other night with thinking about what would it be like to have this sense of being agitated or the tension which inevitably accompanies a legal experience. Did you have that in mind when you created these very soothing and very beautiful semi abstract flowers and plants and birds? RJ: I actually sat in some hearings at the children’s courthouse in Florida and it’s a pretty scary situation. The kids looked scared. So, from that experience I realized that if I was going to make paintings for a children’s courthouse I had to respond to what the children wanted; and also a lot of social workers, the lawyers, the people that worked there were really saintlike, and they were really working to try to help these kids. EJS: How did you go about finding out what would evoke a positive response among children? RJ: Well, I interviewed them. Previously, I worked for a junior high school in Brooklyn where I did a painting for the ceiling. I had proposed a fairly abstract black and white painting and the kids hated it. They did not want a black and white abstract painting. They wanted life, living things, and color. I mean the obvious things, but I had to be very focused about having images that they could recognize so when you look at the painting, all those birds are actual birds that are found in that part of Florida, and there is a kind of floaty-ness and soothing color to it that makes you feel good. EJS: These are immense paintings. If you could, outline a little bit about your technique, how you start, how you delegate, and just a bit about the process in creating these extraordinary images? RJ Well, I start out with a maquette as a way to work out my ideas on a smaller scale, which usually has to be approved by the committee that agrees that it could be made for them. I also have two main people that I have been working with right now: Mark Tambella, my technical assistant, who helps me to physically make these big things. There are a lot of challenges as an artist. You think you know something and once you start actually doing it to this scale you realize you can’t plan for everything that needs to be done. It’s a lot of work, and it couldn’t have been possible without Mark Tambella. I also have the help of Nicholas Freberg in the studio who helps with a lot of the gridding and transferring of imagery that is involved in making these paintings. EJS: Who are some of the artists in the back of your mind that might have inspired you? RJ: I think the initial inspiration to work large comes form pre-Columbian art. Traveling as an art student to Teotihuacan and Mexico City, seeing Frida Kahlo and things that were not being taught at the art school at the time and then coming back to San Francisco with this kind of richness of how the pre-Columbians painted their walls. I think it was the directness, the different kind of stylization of the figure and color that was and continues to be an inspiration to me. You also can’t ignore someone like Georgia O’Keefe as part of an inspiration just for how she dealt with the subject and the locale of the Southwest because, you know, this is something that keeps coming up in my work. The idea of using nature and investigating nature, playing with scale, and the whole idea of what is a flower. It’s this little thing that becomes so immense inside of you and how big that thing can become as an image, and how to communicate the experience of this plant to someone else. EJS: So would you say that you are an artist that responds very directly to nature? Maybe you could talk to us a little bit about how you respond to the natural elements that you see around you, or the locale that you’ve been painting in? RJ: It’s funny because what I’m painting is so tropical looking and it was painted in the dead of winter in Canaan, New York where we happened to have mountains of snow everyday. I think part of it is responding to your memory or your experience of something instead of directly describing or illustrating something you’re looking at. So maybe the severity of the winter experience made me enjoy the colorful imagery even more. It’s contrast, I think, partly. EJS: In these paintings there are certainly passages that are very representational as well as abstract. I am curious to know about your process of research for the flora and fauna of Florida. Did you look at a lot of books? RJ: I have lots and lots of books, but it’s more formal for me. I mean, there is a form I want, such as a line to do something, and if a wild plant breaks off or branches off across the plane the way I want it to, then that will be the plant that I’m drawn to. The hibiscus flower in that painting is such a big decal of what Florida is, but to undercut the obviousness of it, I cut it and used it as a hard edge on something that is not hard-edged at all. So it’s kind of playing with some things and altering how something relates to something else that may or may not be so obvious. Those are kind of intimate things when you’re working small, but somehow I have to envision that as a large experience also. EJS: Let’s continue that subject of scale. Do you have a different way of conceiving your small canvases? What is the difference for you between working on a large scale and a very small scale? RJ: Well, the small can always be big, but its not like the big becomes small. To be able to keep all of these little occurrences or experiences on a small scale is a way to envision larger things. Even if it isn’t a large thing, I always think it could be. I realized that that was the kind of experience of painting that was most challenging to me at the time, to make something that covered the whole wall. I recently did some small paintings at the John Davis Gallery in Hudson, NY, which were different because they were oil paintings on cardboard. For me, that was kind of poetic because as a child we painted on cardboard because it was an available material and I love how delicate it is, kind of like drawing more than painting. EJS: I wondered if you could just talk a little more to us about the role that various techniques play in your work or any other aspect of the technical preparation that would elucidate us in terms of understanding these and your larger production? RJ: I think most of my technique has to do with layering or creating a certain amount of conversation between layers. I work on large sheets of paper and paint on top of them as a way to create this layering and that’s something that I’ve developed in the studio over many years. It initially started by painting on sand to absorb the paint and to create a different kind of texture or gluing things to the surface to keep them fresh. From there I worked with a print maker, Chip Elwell, in New York who was a master printer who introduced me to Japanese paper, which really became the surface that was able to hold very delicate marks and stains and transitions of layers that are ultimately what fascinate me in making a painting. So technically everything supports that kind of formal conversation. EJS: You very recently completed a commission at the University of Michigan. Perhaps you could say a word about that and what other public commissions you have had? RJ: The commission in Michigan was really interesting. It’s the exterior of a forty-foot dome that is the top of a wind tunnel at the University of Michigan School of Engineering. They wanted me to make a painting for them because they saw wind in my work, which I thought was a compliment. The idea of movement and how things move in a painting is something that is very exciting to me, but it certainly was a challenge. We will be going out there this September for the inauguration, so if you’re anywhere near Ann Arbor, check out the School of Engineering. It’s hard to describe because it relates to what we have in the room but it’s actually a little more graphic with less nature in it. EJS: What are some of your future plans? RJ: Right now I’m working on one more mural. I keep thinking this is it . . . I want to stop making murals, I want to go back to making paintings, but I’m working on a new mural for Miami International Airport that I will install in November. This is a project that has been coming and going for a long time and it’s finally happening, so that’s what’s in the studio right now.